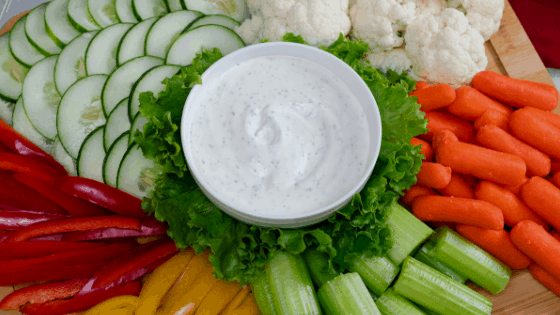 This Homemade Ranch Dip is great when eating vegetables or eating chicken wings. The flavor is smooth and even though it is made using dried spices, it tastes fresh! This dip is so easy to make! It’s as easy and throwing all the ingredients into a bowl and giving it a stir. It really is that simple! That’s what makes it so great for parties and last minute snack attacks. This recipe creates a large batch so it’s perfect to serve with appetizers for a crowd or for packing lunches for the week. Ranch Dip is Great for Wings, too! Have someone in the family that isn’t a fan of spicy wings but the rest of the family loves them? This homemade ranch dip is perfect for taking the heat down a couple of notches. It gives a cool and delicious flavor that makes spicy food bearable for those that like milder food. Even the spicy wing lovers will be dipping into recipe because of how flavorful it is! This homemade ranch dip is perfect for vegetables and chicken wings. Mix sour cream, mayonnaise, and vinegar together. Add in spices and mix well.